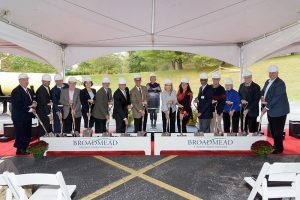 Wohlsen Construction and continuing care community Broadmead recently celebrated the official groundbreaking for the Master Plan project at the Broadmead campus in Cockeysville, MD. Designed by RLPS Architects, the project spans several buildings across the 94-acre community and includes the construction of new buildings as well as additions and renovations to occupied areas. The Master Planning project was developed to enhance Broadmead’s multiple levels of care, create space for new residents, and enhance the various amenities, including fitness and wellness spaces. Two new independent living buildings will be constructed which will feature five different floorplans and underground parking. 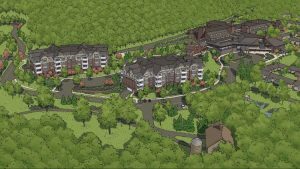 Additionally, the campus’s Healthcare and Rehabilitation Center and Dementia Care Center will undergo upgrades to improve existing resident space. Also included are renovations and additions to administrative, wellness, and social spaces, such as a new aquatics center and renovations to the therapy, activity, and dining spaces. Extensive sitework and landscaping will support the new spaces while maintaining the campus’s natural beauty.